I visited mom this weekend, and her local yarn and haberdashery shop is going out of business so we went a bit bananas. 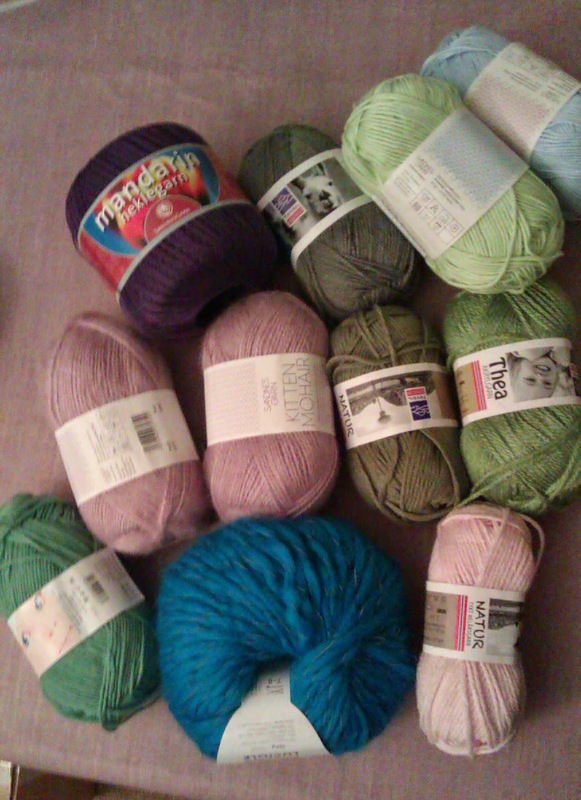 we bought mainly yarn and table cloths though, all things bought with a purpose in mind. The yarn was 40 % off and everything else up to 70 %, there was not that much left so we went home with things that had a plan to turn into something soon. 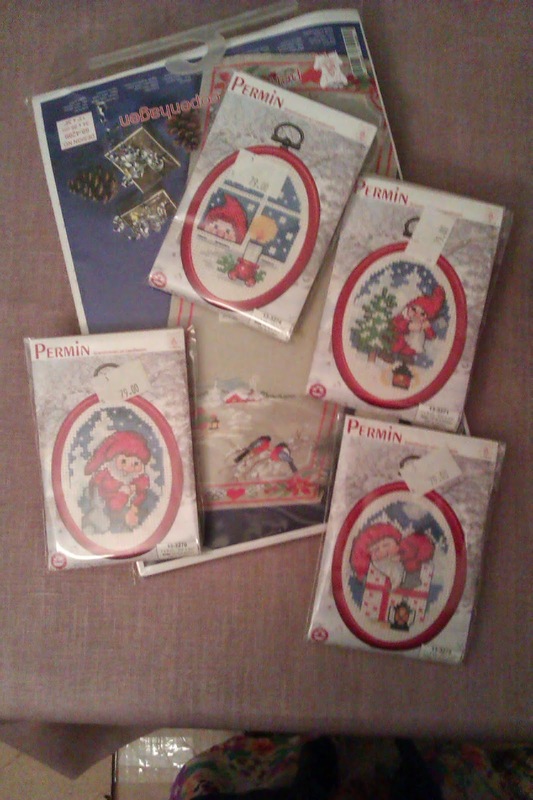 But I did buy some cross stitch supplies too, Permin is usually really expensive so I hoarded a little. Since I know a lot of people who I know would love a finished picture and even some who would like a picture to make for themselves I thought it was safe to buy four of the small ones. Mum bought the big table runner and I will make it for her. 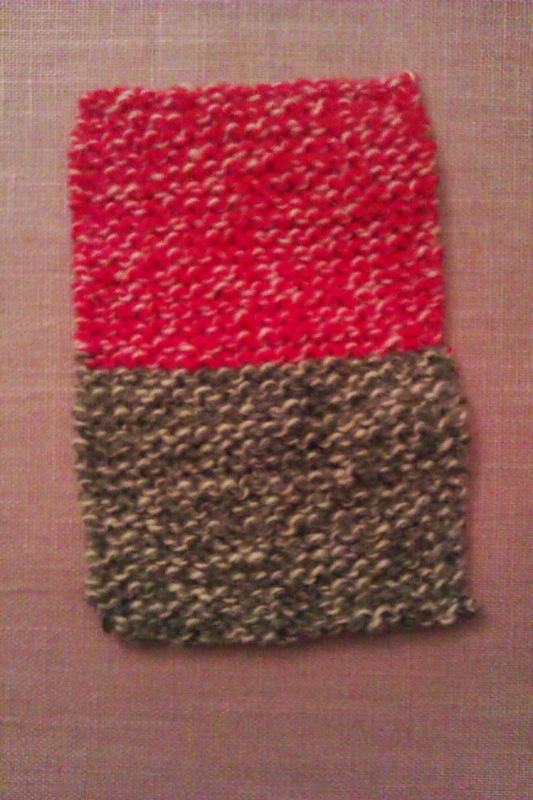 I also bought some red bellpulls, but I didn't take a picture of those. We went through some of mums yarn stash and found some almost finished items and lots of yarn, I got these two little things. 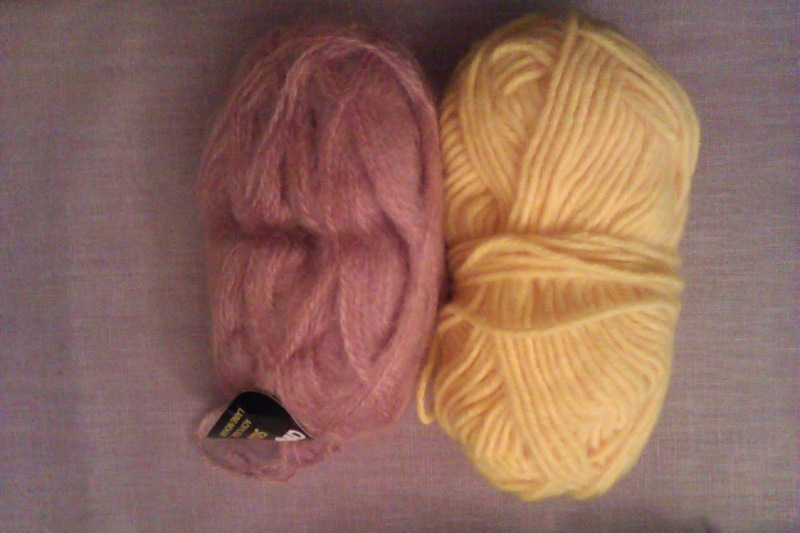 Mohair from the 80's I guess and a really yellow thing that I hope will turn into something easter-y. We also found some of my very first yarn, a gift from my aunt and uncle on my ninth birthday, I was not a very avid knitter, but I did manage to make this little thing. The bunny on top was a gift from my old job, she has lived on top of the dollhouse ever since, she looks like me which is why I got it I think. I love her too. I need to glue the ladder as well, because it came off some time ago and used to be on the first floor so now no one can get up to the second floor. But I will wait until I have painted it to attach it to it's proper place. Valmin have been playing with the house all day hopping in and out of the first floor, I wonder if he will ever venture up to the second? I have just painted it, the bunnies will have to find something else to play with. Or maybe I will leave one room for Valmin to explore in. His new trick is to hop onto the sofa when there are people sitting there :O He is getting to be so brave! But thank you for the suggestion, but I think we need the house to house my supplies so that the sofa is free for binkies and cuddles.